Published 2001, 2004, 2006 by Stabenfeldt, USA. At the start of the first book Jenna and her family have moved from London to the countryside where Angie and Dave are trying to make a go of running a hotel. Jenna only has an elderly pony named Mr. Tufty to ride. She soon becomes involved with James and Alice, two teemagers who are staying at the hotel, Mr Penrose an elderly neighbour who used to work there and is always hinting at supernatural goings on there, and the gorgeous Steve, a young man who owns two racehorses. Each of the books combines a supernatural mystery with a real life one. There are also subplots involving Jenna getting a horse of her own, a thoroughbred named Gold, and training him, and a love triangle between Jenna, James and Steve. 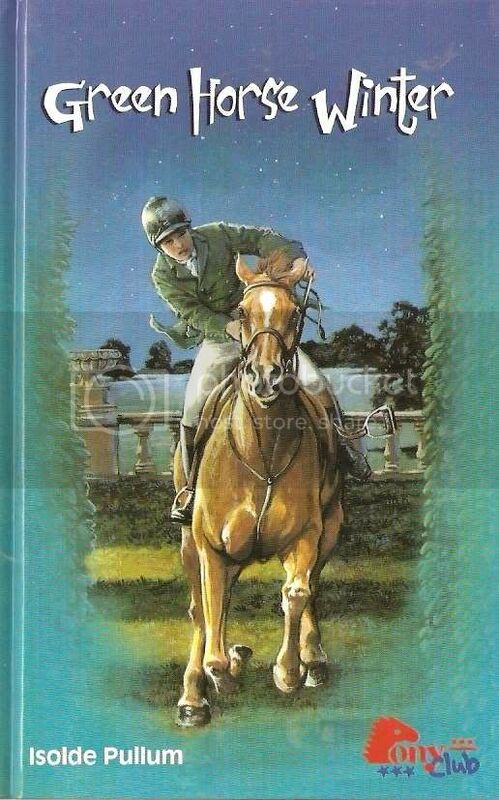 This trilogy is a series of modern horse stories from a British author, but published in the USA. Although modern, it is better than the average book of the sort, yet it does suffer to some extent from the usual pitfalls of the modern pony book. The three books in the series are all lively and very easy to read, quite well-written with believable characters. The mysteries keep you guessing and are reasonably down to earth, with none of the more unbelievable Famous Five type scenarios which can plague children’s adventure stories. The supernatural element, which is becoming almost a pre-requisite in the modern pony story, is well done and subtle and blends fairly well into the rest of the action. It is not too overpowering and does not feel ‘tacked-on’ which I find are two common problems with fantasy in modern pony stories. The real life mysteries and the supernatural puzzles conjoin together and overlap well. The main horsy characters, Mr. Tufty and Gold are quite well-drawn and not two dimensional (although some of the minor ones are). There is also enough horsy action to satisfy most readers, it feels integral to the story rather than just a backdrop. And you do feel Jenna cares about her horses. However, on the downside is the romance element, which to my mind is too obtrusive and is not very subtly handled. The relationship between the 14-15 year old Jenna and the twenty something Steve is a bit creepy. Its not that it’s unnatural for a girl to have a crush on an older man (and that part is well-done and believable) but what is a bit unsettling is that Steve also seems to share the attraction. Although actually nothing goes on between them, I would not feel this appropriate for a young child to read about. In fact there are two other adult males in the books who also seem attracted to Jenna too! On a similar theme, there also seems to be too much attention paid to Jenna’s looks. The author always seems to be harping on about how pretty she is, she has all the men around her in thrall to her! Although to be fair to her, Jenna herself is not obsessed with her looks, it is more the narrative. I know there is a trend nowadays to emphasise that being feminine and pretty is not incompatible with being horsy, but I think the point is pressed too hard here. At the same time she is also one of those insufferable 'natural riders' which seem to crop up a lot in pony books, although she has barely ridden except for a few riding lessons and plodding around on an elderly pony she is soon managing thoroughbred racehorses with ease! I actually think young readers would be able to identify with Jenna better if she were more normal looking and was not such a great rider. At times she does come across as having too much and not appreciating it! I find the heroine of the author's other pony book, Brazen Horse, more sympathetic in that she worries about her weight and has problems controlling her horse. The constant change of view-point in the narrative is also a little jarring, everyone seems to get a look-in. Even the horses’ thoughts and opinions are - rather bizarrely - explored! Another annoyance (which is probably editorial in nature as I have noticed it in a few American published British-set books) is the Americanisation of the language. Vacation is used instead of holiday, Mom instead of Mum, etc. To be fair it is not too bad, certainly not as horrendous as the British-set pony book I read a while back where the money was in dollars not pounds! But it is a slight irritation and I feel it is patronising to the young American readers who surely have the sense to realise that people talk differently in England! However on balance, the book has more good points than bad, and if you can overlook the rather overpowering romance elements and the creepy older man thing, the stories are definitely worth reading. Claire....agree in every particular with your review....you hit all the points that I liked and all the ones that I didn't! BTW, the bit about the Americanisation is the one that irritates me the MOST....I too, have come across a few recently published books that were set in Britian but had the money in dollars, not pounds....one even referred to Andrew Jackson being on a bill....I came close to throwing the book across the room, the only thing that prevented me from doing so was the fear of breaking something I actually cared about!. This sort of thing didn't happen when I was a child.....aside from the title change, Vian Smith's Tall and Proud is unchanged from the UK edition King Sam, National Velvet too....in that book, they included a two or three page glossary that "translated" English to American terms, which is a sensible thing to do! All that said, the trilogy was worth reading, and I certainly don't regret it....will have to keep an eye out for Brazen Horse! I have been reading a few Stabenfeldt books lately and I must admit I am quite pleasantly surprised. I have enjoyed most of them I have read so far, certainly they are better than the saddle club/chestnut hill type stuff. I am in the process of writing about them for my blog with some mini reviews of a few of the books. Should post it within the next couple of days. Claire...I agree, I've adored some books that have fantasy elements, the two you mentioned, Can I Get There by Candlelight by Jean Slaughter Doty, is another. It's when it turns up in virtually every book that it starts to wear on you! Fantasy is "in" at the moment, so publishers, as you say, are sticking it in everywhere. Sigh..... This too shall pass, I'm sure! The Bunnicula books do sound fun. What age are they for Susanb? I wouldn't mind getting them to read to my girls if they are not too scary. I have not read the Green Horse Hotel series but to continue on the theme of Americanising children's books, I have also read one where the country it was set in was a sort of mixture of England and America. It was quite bizarre. I can't rememeber what it was called however......I think I must have given it away or threw it away in disgust. Surely it is interesting and educational for children to read about other countries and cultures? I liked reading the Black Stallion and Flicka books when I was a child because they were set in America not in spite of it. Great review of the "Green Horse" books! Good points about Jenna as a character. And I strongly agree about loathing the "Americanization" (or often in the case of the Stabenfeldt books I think it is an attempt at "internationalization" not just "Americanization") of these books and most others published by Pony/Stabenfeldt. I'm an adult but knowing I still read a lot of juvenile literature, especially pony books, my husband gave me a membership in the Stabenfeldt book club a couple of years back and I got quite a few of their books as a result. Their editing and translation are truly very bizarre and erratic. In some series, they leave the setting of the story alone and largely leave terminology unchanged as well. I prefer that even though some terms may be unfamiliar and/or unexplained. In a very few books, such as the Malin Stehn Humleby Farm series, they actually include footnotes for the horse terms used -- also a great way of doing things. But in a lot of the books they try to be vague about the country in which the story is set. I.e., the Diablo series. In some of them it is quite clear the books are set in a European country, but in some they have actually changed a few terms to "Americanize" them, like using "dollars" for the currency, but in all other aspects it is quite clear there is no way the books are set in America -- the kids have access to public transportation systems that just aren't in existence in the U.S. except in major cities and things like that. Also, translation of horse terms into English is strange. They don't bother to find the actual U.S. English word -- e.g., several of the series have the characters be so-called "horse-keepers." As far as I can tell this is what we in the U.S. and I believe Britain also would call "grooms." Other examples are odd terms for the indoor riding arena/school/ring and things like that. They don't give the correct U.S. or British horse term but I'm guessing instead some more literal translation, hence the "horse-keeper." I really wish Stabenfeldt would just keep the country of origin as written by the author but also, where translations are needed, try to find the correct translation of terms. Footnotes or a glossary would be fine for explaining both horse terms (as an educational aid) and for idiomatic expressions. In general I enjoy the Stabenfeldt books but these weird translation issues and I suppose attempts to give the books universal appeal actually lead to some weird terms and/or information being put out. And some of the info is just plain wrong or wildly implausible. There's one series where all the kids ride their stallions and it is one where the author herself was quoted in interview saying she was deliberately not revealing the country in which her books are set, though she has a specific place in mind. Odd approach to writing as far as I'm concerned and no doubt contributes to the strange mixing of terminology and almost-but-not-quite translations, etc. Stabenfeldt does have some good authors, though: Gil Morrell (Pony Trek etc. -- wonderful contemporary stories but in the classic pony book mold), Angela Dorsey (strong supernatural elements but they are integral to the stories and well done I think), Jenny/Jennifer Hughes (generally good though predictable and the protagonist is always a very successful character, kind of like Jenna in the Green Horse books), and a few others. Pony is the American arm of Stabenfeldt but the company originates in Norway. Clearly there are challenges in trying to serve an international audience. But like darkhorse said, surely it would be far more educational and ACCURATE to be clear about the setting of each story and give accurate and correct information about the culture of that setting, and careful in translation to use accurate terms! I am glad to have found another adult reader who has the same good opinion of the Stabenfeldt books as I do. Of course there are a few stinkers but on the whole they are much better than the rubbish or very childish British stuff around at the mo.. No wonder our best British pony writers are getting their books published by them and not a British publisher. Its such a shame that they are hard to get here. Are you American or British? I agree with all you say about the 'internationalization' of some of the books, it is probably the main fault of them. And some of the translations are not good, the 'Sara' series is the main culprit. Just wish I had made a list of some of the weird and wonderful translations before I sold my copies of those books! Please feel free to add your comments! I am trying to get a higher profile for the Stabenfeldt books as I think they deserve a wider British and adult readership! Thanks for the welcomes and the blog link! I'm very glad to have found this forum! (I'm from the U.S. by the way). Great to have another US member on the forum!